The economy is going to collapse. Maybe not tomorrow, maybe not next year, but we’re not going to live the rest of our lives in a bullish market. I genuinely believe that student loan debt will tear down this economy. You’ve got so many kids who are tens of thousands, even hundreds of thousands of dollars in debt on 9% interest… making $34,000 / year… and are still getting big loans to buy apartments and cars. I don’t know how long the economy can be artificially held up, but at some point, it’s going to hit. And it’s going to hit hard. When it does, everyone’s going to blame the colleges. The same thing that happened to the banks in 2008 will happen to colleges during the next recession, and the conversation around colleges will change. The top schools like Harvard and Stanford might be able to hold on a little longer because of their brand, but a lot of state schools are going to be in trouble. With so much money in the system, companies can get away with spending money on things like billboards and TV commercials. But when the economy melts, big businesses will fold because they’re overleveraged… and the ones that hang on will get their marketing budgets cut massively. 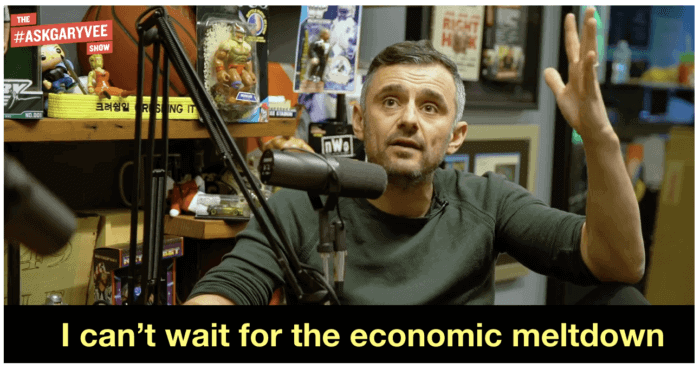 That means they’ll have to make $1 work like $10, and VaynerMedia will grow much faster because we’re established as knowing how to do that. You know how many people buy wine in the recession? Less people. You know how many people buy water filtration systems? Less people. You know how many people are buying homes? A lot less people. It’s just the truth. In the last recession, Wine Library had to deal with refund requests from people who bought a lot of wine even though we were already using that cash in other areas of the business. You have to have the stomach to get through the “dark” times in business, and a lot of entrepreneurs just don’t. This is one reason why I’m weirdly looking forward to global economic carnage. Right now in the “good” times, entrepreneurship is being put on a pedestal. There are so many B, C, and D players winning when they shouldn’t be. There are so many people posturing and overleveraging themselves to make it “look” like they’re winning when they’re actually not. Truth and merit will always win in the end. If you’re not a good entrepreneur, you shouldn’t be able to reap the rewards of the game. If you’re not actually good at business, you shouldn’t be winning at business. When the world melts, people will get much more practical about how they live their lives, and entrepreneurship will be recognized as something hard. Not something that anyone can do. A lot of people think I’m rooting for the world to melt only because I selfishly want to take advantage of it. But the reality is, I want the world to melt because other people are going to be happier. Not “paying the piper” in 2009 for the economic crisis and turning to bailouts messed our culture up in a way nobody talks about. Because now, people are living.fake life. They’re keeping up with the Joneses. When there’s a correction, everyone is going to get back to the right mental place and do what they actually love to do instead of chasing a fake lifestyle. The next economic meltdown is going to be the beginning of happiness at a bigger scale.